Somewhere in the jungle there’s a man who was somehow raised by apes and provided with the ability to survive in this harsh environment; his name is Jungle Jack (and definitely not Tarzan) and he’s the theme of this online slot from High 5 Games which comes with a vine-swinging free spins feature. Jungle Jack is a five reel slot with three/four rows and seventy five fixed paylines; creepers wrap themselves around the reels while the backdrop displays a pool of water deep in the jungle. The higher value symbols include Jack, his red-haired companion (how did she get there?) and an ape; J, Q, K and A represent the lower values. The tree is wild, it appears only on reels two, three, four and five and it will substitute for all others to help form winning combinations except for the banana scatter symbol. The wild can also appear stacked on the reels. Three bananas – seven free spins. Four bananas – fifteen free spins. Unfortunately it’s not possible to trigger any additional spins from within this round. The wild may also act as an expanding symbol when it lands on the reels and you will see it stretch to the left as far as reel two to help out with some bigger wins. Any wins on this particular spin will be evaluated when the wild has finished expanding. 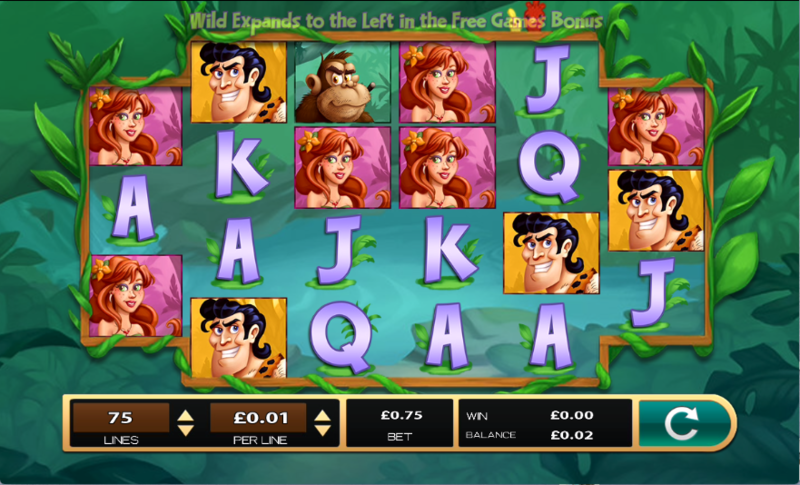 Some areas of the jungle must be crawling with humans raised by apes but that’s Ok as long as they provide us with enjoyable slot machines; free spins and expanding wilds add to the cartoonish fun here and this game comes with an RTP of 94.90%.